During the first third of the 19th century, the average American saw few of his country's gold or silver coins, if any at all. Strangely enough, in relation to the size of the rapidly expanding nation, not many coins were made. A combination of factors, including Congress' ill-founded 15 to 1 silver/gold ratio, questionable Mint procedures, fluctuating gold prices and the large domestic supply of Spanish silver pieces, all served to limit the number of U.S. coins in circulation. By the early 1830s, with Latin-American revolutionary chaos subsiding, Mexican silver exports jumped, and along with Congress' new 16 to 1 silver/gold ratio, U.S. coinage flourished. Mintages ballooned dramatically, and the introduction of steam-powered coining presses in 1836 only enhanced the Mint's production capacity. While the ratio change, which favored silver, should have driven those coins from circulation, what actually occurred was an increase in the number of silver coins struck, particularly the smaller issues. Apparently Mexican mine owners found it profitable enough to sell their ore to the convenient and silver-hungry American market, despite the lower price. The U.S. was only too happy to turn their bullion into coins. Changes were also taking place with Mint personnel: the new Director, Robert M. Patterson, hired the exceptionally talented Christian Gobrecht as Assistant Engraver. Gobrecht, a follower of the neoclassical style, was instructed to completely redesign the coinage using the English figure of Britannia as a model. Working from sketches made by Titian Peale and Thomas Sully, Gobrecht fashioned a majestic image of Liberty, and in 1836 his Seated Liberty design was first used on silver dollars, the quasi-pattern "Gobrecht" issues. By the next year, working dies were ready, and production of the new half dimes began. Only No Stars half dimes (and dimes) of 1837-38 accurately reflect Gobrecht's original concept. Liberty is seated on a large rock, holding a pole topped with a Liberty cap. The figure sits alone in the field with only the date below, imparting a cameo, medal-like appearance to the coin. The reverse essentially the same on all half dimes from 1837 to 1859 features the denomination HALF DIME encircled by a laurel wreath, in turn surrounded by UNITED STATES OF AMERICA. In 1838, 13 stars were arranged around the image of Liberty, creating the Stars Obverse type, with each star hand-punched into a previous No Stars die. 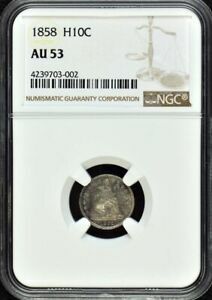 Collectors refer to the coins of 1838-1840 slightly different in appearance than later issues as the "No Drapery" variety and often include them in type sets as a separate design. In 1840, Robert Ball Hughes made the first of many modifications to come. He added extra drapery behind Liberty's elbow, and unfortunately, "fattened" the overall design. Thirteen years later, to combat widespread melting of silver coins following the California Gold Rush, Chief Engraver James B. Longacre added arrowheads on either side of the date, denoting a slight weight reduction. The Stars obverse design, without arrows, resumed in 1856 and continued until 1860, when the Legend Obverse design debuted. The last changes were made in 1859, when engraver Anthony Paquet slimmed Liberty's arms, reduced the size of her cap and enlarged her head. But the most notable difference of Paquet's revision is the hollow center of each peripheral star. Some type collectors include this minor variety in their sets. As one of the five major design types of the popular Seated Liberty series, Stars Obverse half dimes are collected by date and mintmark as well as by type. Scarce dates abound, and some are nearly impossible to find, particularly in high grade most notably 1844-O, 1846, 1849-O and 1853-O No Arrows. Type collectors searching for gem specimens will most frequently encounter the Philadelphia coins of 1857 and 1858. 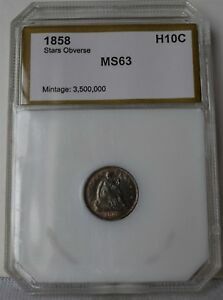 The series includes two well-known oddities, the 1859 and 1860 "transitional" issues. Both were creations of Mint Director James Ross Snowden, whose driving ambition during his tenure was to fill the conspicuous gaps in the Mint's collection of U.S. coins. He authorized the striking of several "fantasy" pieces, including the Class III 1804 dollars, certain Gobrecht dollar restrikes and the so-called "transitional" half dimes and dimes. The half dimes had the Stars Obverse paired with the "cereal wreath" reverse of 1860. These "coins without a country" (they lack the inscription UNITED STATES OF AMERICA) were traded to local collectors for coins missing from the Mint collection. 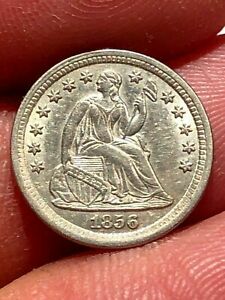 The 1859 is a proof striking and very rare, with only 12-15 pieces known, but the 1860 pieces are business strikes, and with an original mintage of 100 coins, occasionally appear on the market. A tiny number of proofs totalling fewer than 1,000 pieces were struck from 1838 through 1859, with 880 issued in 1858 and 1859 alone. Proof specimens before 1856 are rarely seen. Conversely, with a total of 42.7 million pieces struck, business strikes are quite plentiful, at least in lower grades. Only the Philadelphia (no mintmark) and New Orleans (O) Mints produced this design, with the southern branch mint producing fewer coins, but ones that saw immediate and heavy use. For that reason, Philadelphia issues appear more frequently, especially in the higher grades. New Orleans mintmarks are above the bow knot of the wreath. Many weak strikes exist in the series, making those issues more difficult to grade. Unfortunately, the addition of peripheral stars in 1838 only added to striking problems. 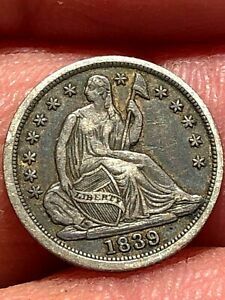 Coins from New Orleans are usually seen with weak strikes, and Philadelphia issues between 1856 and 1858 are often weakly defined on the central drapery and head of Liberty. Higher grade pieces will first show friction on the obverse on Liberty's knees and bust. On the reverse, wear first appears on the ribbon bow. No common counterfeits plague the series, but bogus specimens have surfaced in the past with added O mintmarks, removed arrows on 1853 coins, as well as altered 1858 pieces masquerading as the rare 1853 issues. 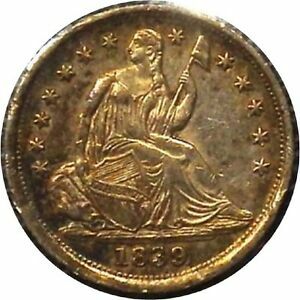 By the time Stars Obverse half dimes ended their run, America stood on the brink of civil war. The coming conflagration would see many of the little coins disappear into hoards and melting pots. Production ended in 1859 to make way for the new Legend Obverse design with the fanciful "cereal wreath" on the reverse. However, Christian Gobrecht's Seated Liberty lived on until Congress ended the denomination 24 years later, with legislation that history would call the "Crime of `73." Blythe, Al, The Complete Guide to Liberty Seated Half Dimes, DLRC Press, Virginia Beach, VA, 1992. Breen, Walter, A Coiner's Caviar, Walter Breen's Complete Encyclopedia of U.S. and Colonial Proof Coins, 1722-1989, Bowers & Merena Galleries, Wolfeboro, NH, 1989. Carothers, Neil, Fractional Money, A History of Small Coins and Fractional Paper Currency of the United States, John Wiley & Sons, London, 1930.